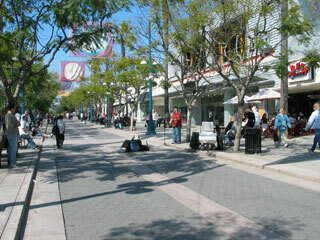 A visit to the Third Street Promenade (website) in Santa Monica is more than a shopping experience. You'll stroll down the middle of a street that was closed to vehicular traffic years ago. Now pedestrians rule the road, at least within this three block stretch located within walking distance of the Santa Monica Pier and spectacular views of the Pacific Ocean. Bordered by the Santa Monica Place shopping mall to the south, and busy Wilshire Boulevard to the north, Third Street is lined with a variety of shops ranging from traditional to unusual. Clothing outlets and stores prevail, sprinkled amongst specialty shops, book stores, gift shops, restaurants and coffee shops. Third Street Promenade attracts a wide spectrum of street performers who display their talents for onlookers in hopes of a donation from an appreciative visitor. The city of Santa Monica issues permits to street performers, and talent is obviously not a requirement to obtain this authorization. Walking down the street you'll witness a variety of performances that range from the downright good to the blatantly unqualified. Either way, it's quite entertaining. If you find an entertainer who amuses you, they will be grateful for a donation of a dollar or two. You'll find that there are more performers on weekends, when there are more visitors. After visiting Third Street, you'll want to continue on to Santa Monica Place (website), a modern shopping mall complete with department stores, food court, restaurants, boutique stores, specialty stores, a market and more. The mall was fully renovated and re-opened during late 2010.